As always, this is a recap of my trading activity from the previous month. Note: Most of my trading activity is a based on the analysis from my Parity PEG Price Reports. Each month I analyse at least 20 stocks in a Monthly Parity PEG Price Report. 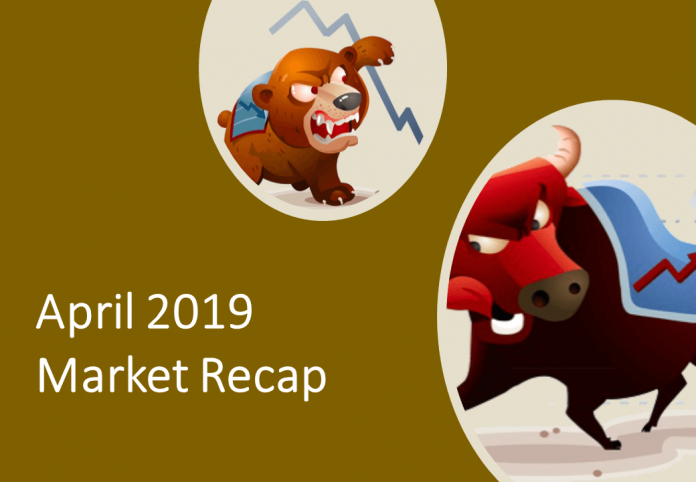 The report usually includes coverage of any stocks I have traded (bought or sold) that month – Those detailed here. The monthly reports are for members only. On the 18th March I sold Miton (MGR). The 2018 Results announced on the same day were reasonably impressive here – AUM up 14%, Adjusted PBT up 34%, Net Cash at £25.5m, the Dividend up 43% (with an Interim Dividend to be introduced this year). A revised (Liberium) Broker note (from Research Tree) indicated negative EPS growth in 2019E with impressive positive growth in 2020E. However, on the basis this assumes there will be no kind of market correction in the meantime (meaning AUM would probably reduce (affecting Profit) I decided to sell out. I actually should have sold out much sooner here after a 25% fall from the high. Ten Entertainment (TEG) – About 20% or so from it’s high I decided to get out here. My analysis indicates a fair value price of 400p+ here but I just don’t see it. This is based on 40%+ EPS growth in 2019E and 20%+ EPS growth in 2020E. Sure, it’s possible but with the market not seeing it either I decided it was time to sell. I can always buy back in and I possibly will, if I am proven wrong and we see a new high sometime soon. Xpediator (XPD) – Something I have been holding onto for way too long and should have sold on a 25% fall from the high. In addition to this my analysis has been indicating to me for some time that this was overvalued. Kicking myself a little (OK, a lot) as I should have sold out for a decent profit rather than break-even (actually, a small loss). Sanderson (SND) – This is something I really shouldn’t have bought in the first place. My analysis showed it was about fairly priced around my Buy price. I can’t even explain to myself now why I bought in. Another break-even (actually, small loss). IG Design (IGR) – With my analysis (Parity PEG Price Report as always) indicating a fair value of 500p or so I decided to take a modest profit here. On the 27th March after not paying up, at about 80p or so I finally decided to buy into T Clarke (CTO). The previous day 2018 Results showed Revenue up 5%, Underlying PBT and Diluted EPS up 23%, the Total Dividend up 14% and the forward Order Book up 22%. On a single digit PER a revised Broker note from N+1 Singer indicated EPS growth of 23% in 2019E and 16.7% in 2020E. There was Net Cash of 25% or so of the current Mkt Cap at the time too. Downside is if just 1 large contract fails. But, with my Parity PEG Price Report indicating a fair value 2 Year price of 200p+ I bought in. I am now at about 25% in Cash again. 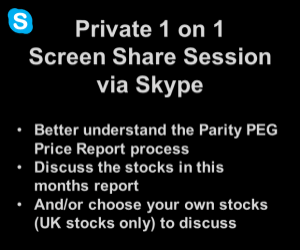 For the reasoning behind the Parity PEG Price Report and access to 20 of them every month (including most or all of those I have traded) – You can find details here.